I didn’t look for the audio of her interviews with those who knew her, as I don’t speak French, but I am glad that the author went in search of those who knew and remembered Madeleine, as I loved their thoughts about her. The common thread seemed to be “I wish I had asked her more questions, got to know her better,” which led to, “I wish I knew my own parents/aunts/uncles/grandparents better, had asked them more questions.” And that made me grateful that in my family we bought both of my parents a Story Worth subscription** so they are receiving weekly emails with questions about their lives which will be compiled into a book at the end of a year. Ultimately, this book was not fully satisfying to me. I love Twitter, so I am now following #Madeleineproject and the author (@clarabdx) and will check in occasionally. This book takes you through Seasons 1 and 2 and currently the author is working on Season 4, so I have some catching up to do. I would have loved more of the interaction with other Twitter followers to more fully develop the story of Madeleine and Paris. Unfortunately I don’t read or understand French, and the Storify links don’t translate, so I probably will not delve too much further into the life of Madeleine. But maybe with all my decluttering, I will create a time capsule of life in the early 2000s that can be discovered by grandchildren in their adulthood. And I will be more purposeful in asking questions and learning about all the people in my life. **I really should work for Story Worth, because I love it so and recommend it to everyone I know! CLICK Story Worth for more information! I received a copy of the title from the publisher for purpose of honest review. I was not compensated for this review: all conclusions are my own responsibility. Click below to enter a giveaway! 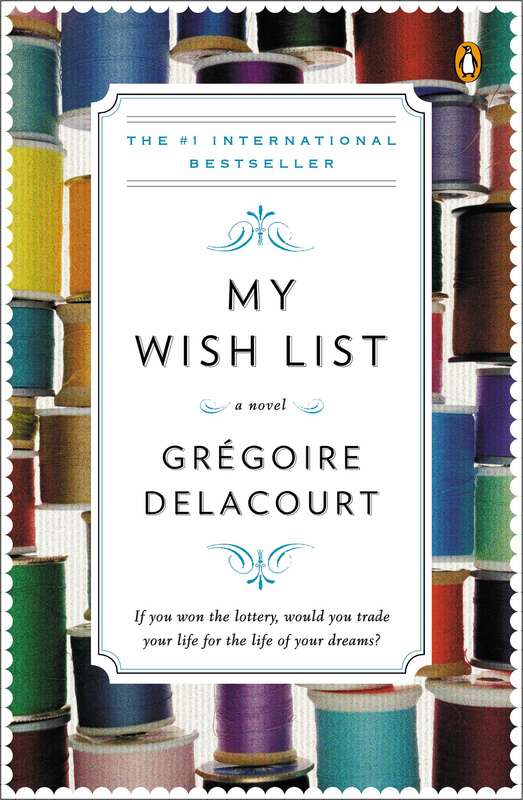 A young woman moves into a Paris apartment and discovers a storage room filled with the belongings of the previous owner, a certain Madeleine who died in her late nineties, and whose treasured possessions nobody seems to want. In an audacious act of journalism driven by personal curiosity and humane tenderness, Clara Beaudoux embarks on The Madeleine Project, documenting what she finds on Twitter with text and photographs, introducing the world to an unsung 20th century figure. 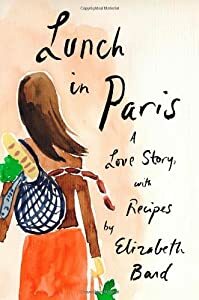 Along the way, she uncovers a Parisian life indelibly marked by European history. This is a graphic novel for the Twitter age, a true story that encapsulates one woman’s attempt to live a life of love and meaning together with a contemporary quest to prevent that existence from slipping into oblivion. Through it all, The Madeleine Project movingly chronicles, and allows us to reconstruct, intimate memories of a bygone era. 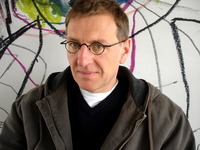 is a Paris-based journalist for the France Info news network. The Madeleine Project has been wildly popular in France. “Paris was the Place” is a story about a poetry teacher, Willow (Willie) Pears, who moves to France to be near her older brother and her college roommate. It’s 1989 and she teaches poetry at a University and begins volunteering at an immigration center where girls who are in France illegally are kept while they await their asylum hearings. She works with the girls to find the words to tell their stories which they will tell the judge. An integral part of the story is the relationship that Willie and her brother, Luke, have with their mother and father while growing up, and the relationship she has with her brother in the present. She is still hurting from her mother’s death and feeling estranged from her father. 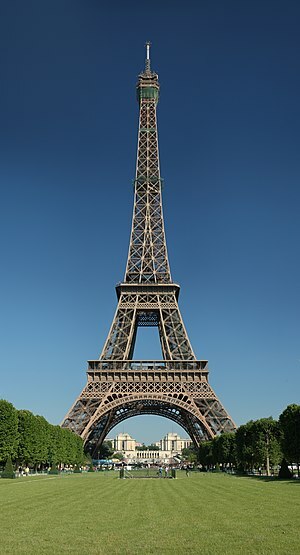 Luke is her connection to the past and her reason for being in France at the present. 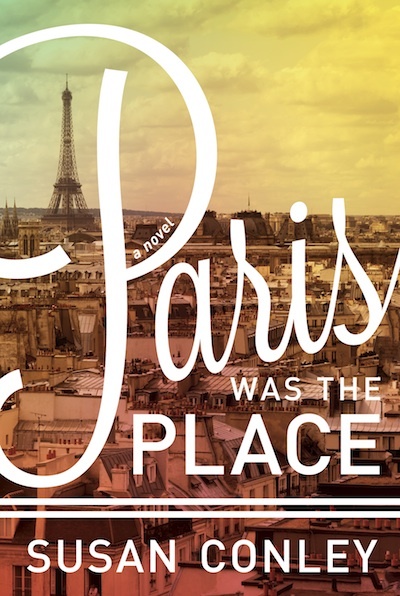 Willie navigates Paris streets and neighborhoods, the Paris immigration system for the girls whose stories she elicits, a new relationship with a divorced immigration lawyer with a young son, and her brother’s mysterious illness. She becomes entranced by the lives of the girls seeking asylum and goes a little too far to help one of them. It jeopardizes her new relationship with Macon, the lawyer, and her friends, but she is forgiven. Her brother’s illness is a pall that hangs over the entire book and sometimes paralyzes Willie. But Willie is awarded the opportunity to go to India to meet with the daughter of the famous poet, Sarojini, in the hopes that she will be trusted to write a book about her story, and she is able to make the trip reluctantly. Willie loved the poetry written by this Indian woman and is honored that she is able to take the words home with her study. Willie has always been enamored with words and their meanings. In this book she gives words and meaning to the lives of the girls at the immigration center, to her mother’s life and death, and to her brother’s illness. Storytelling. This book is about a teacher and storyteller. It’s about the power of words in relationships and it’s about forgiveness and hope. When Willie Pears begins teaching at a center for immigrant girls in Paris all hoping for French asylum, the lines between teaching and mothering quickly begin to blur. Willie has fled to Paris to create a new family, and she soon falls for Macon, a passionate French lawyer. Gita, a young girl at the detention center, becomes determined to escape her circumstances, no matter the cost. And just as Willie is faced with a decision that could have dire consequences for Macon and the future of the center, her brother is taken with a serious, as-yet-unnamed illness. The writer Ayelet Waldman calls Paris Was the Place “a gorgeous love story and a wise, intimate journal of dislocation that examines how far we’ll go for the people we love most.” Named on the Indie Next List for August 2013 and on the Slate Summer Reading List, this is a story that reaffirms the ties that bind us to one another. Release date: August 7, 2013. Susan Conley is a writer and teacher. Her memoir, The Foremost Good Fortune (Knopf 2011), chronicles her family’s experiences in modern China as well as her journey through breast cancer. The Oprah Magazine listed it as a Top Ten Pick, Slate Magazine chose it as “Book of the Week,” and The Washington Post called it “a beautiful book about China and cancer and how to be an authentic, courageous human being.” Excerpts from the memoir have been published in The New York Times Magazine and The Daily Beast. Susan’s writing has also appeared in The Paris Review, The Harvard Review, The Massachusetts Review, The Gettysburg Review, The North American Review, Ploughshares, and elsewhere. A native of Maine, she earned her B.A. from Middlebury College and her M.F.A. in creative writing from San Diego State University. 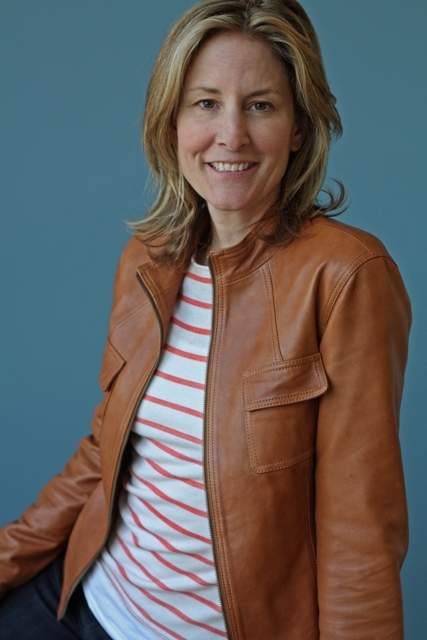 After teaching poetry and literature at Emerson College in Boston, Susan returned to Portland, where she cofounded and served as executive director of The Telling Room, a nonprofit creative writing center. She currently teaches at The Telling Room and at the University of Southern Maine’s Stonecoast MFA Program. I was given a copy of this book by the publisher in exchange for a fair and honest review. 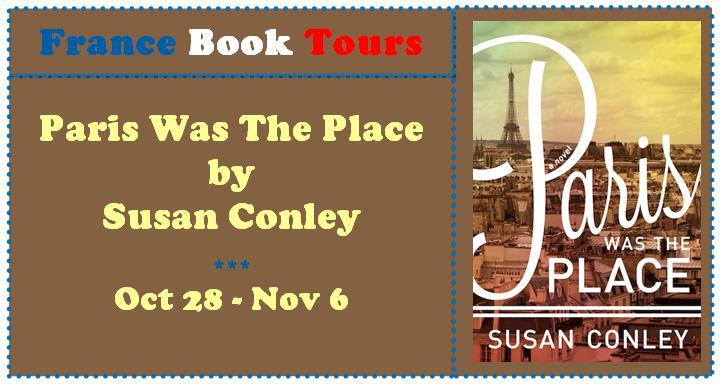 I’m thankful to be part of the France Book Tour! When Emma at Words and Peace asked if I would review this book for her France Book Tours , I wasn’t sure, as I’m not much of a reviewer. I love to read and I love to give my feelings about books. But to dissect them and truly “review” them? Well, I will do my best. AND, if you read to the end, you will learn how YOU can win your own e-copy of this book! Woot! So, thankfully I haven’t been betrayed in such a terrible way by a person in a relationship, but I have had the experience of “starting over” and re-evaluating life a few times. When my daughter went to college, I remember feeling so sad that I wasn’t even able to face the empty house after drop-off day. And then suddenly I recognized that I had freedom – and my motto became “I can do whatever I want!” It was a great year of being foot-loose and fancy free! For the first time since forever. Going to work, watching people mow their lawns, seeing that life was “normal” everywhere else, was hard to bear some days. But life does go on. And on and on. 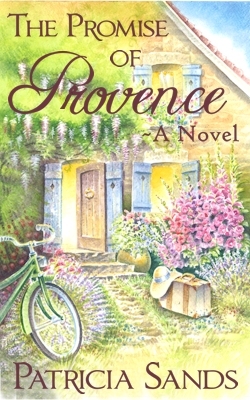 In The Promise of Provence, Kat is encouraged by her great friends, friends whose relationships she began to nourish and cherish as never before. If you know me, you know that I believe in and value the power of friendships – I’m so glad that it was part of this book! Kat also discovers the world of “home exchanges” and her life is never the same. 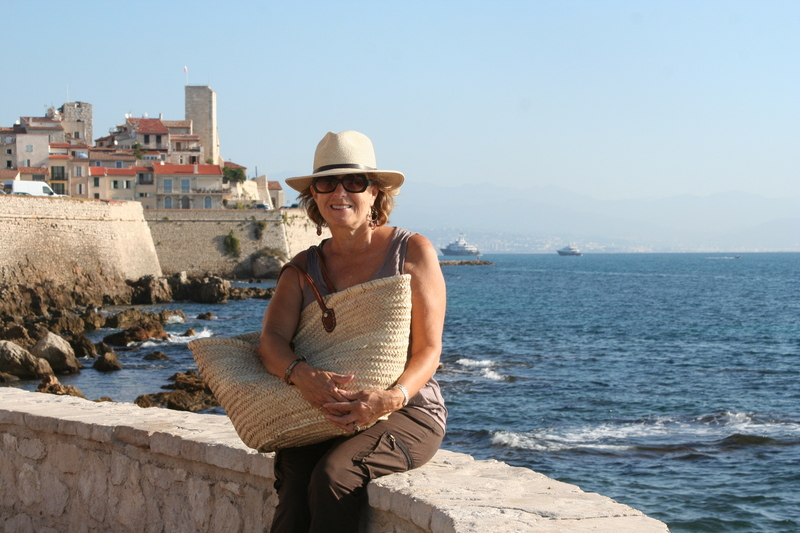 She chooses to swap homes with a family in Provence, the land of Peter Mayle novels. She has traveled to France in her younger days and is glad to revisit. During her first visit she finds that it is OK to be alone. OK to embrace change. She discovers the life of plaisir – pleasure. Mirella: “You know, Katherine, we are masters in the art of plasir. 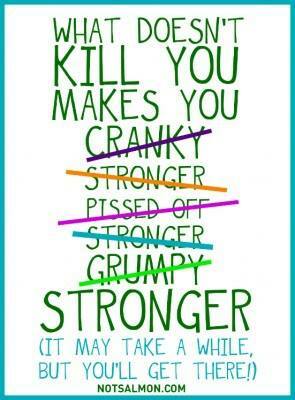 It is the underlying theme of life here. In spite of the many negatives in our society today, the French continue to strive to be artful, exquisite. It is a legacy we do not want to lose. Also the world of pastis (an anise flavored liqueur and aperitif of France) and petanque (a French game of boules, which is like bocce ball)and panier (a basket for carrying provisions) . She meets Philippe and Picasso and hopes to someday return. Not long after, an opportunity arises and she goes – for longer this time, and during her second home exchange she discovers that she truly is self-reliant and feels at home. Isn’t that the way life is? 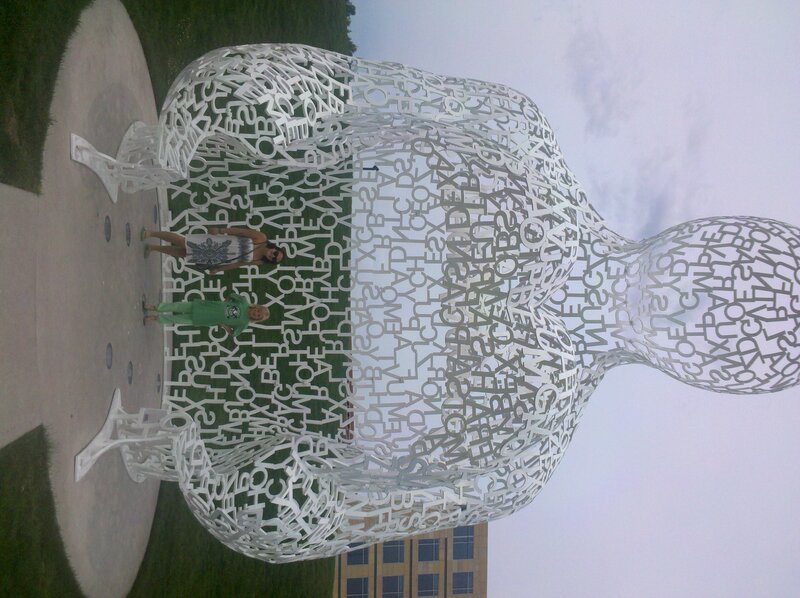 and lo and behold, I have a photo of one his pieces – the same piece – not in Cap d’Antibes, but in Des Moines, IA! How fun. We loved discovering the “Letterman,” as we called him, in the Pappajohn Sculpture Garden one spring day. I received this book as a gift from the author, and although there were times that plodded along for me, it truly was a gift – a reminder that it is always good to seek the plaisir in life, enjoy each moment, savor your friendships, and to be ready for adventure. And now, as promised, a gift for you! 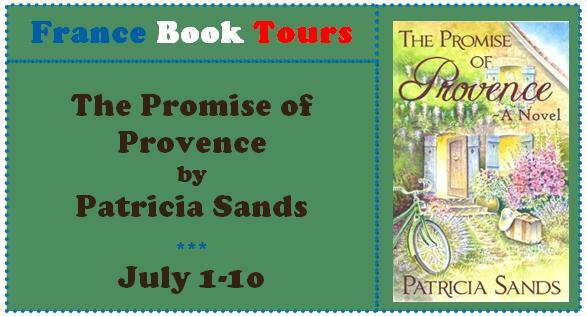 Please leave a comment below and you will be entered to win a copy of The Promise of Provence in e-book style! Winner will be drawn at random and announced on Tuesday, July 9. Also click through below to learn more about the book, about the author! I know that I’m putting her first book The Bridge Club in my TBR list! I just finished listening to the audiobook as I pulled into book club (to discuss “Loving Frank“) and realized that it’s Thursday and Words and Peace has her weekly “I Love France” meme on Thursdays! Once again I’ll participate! 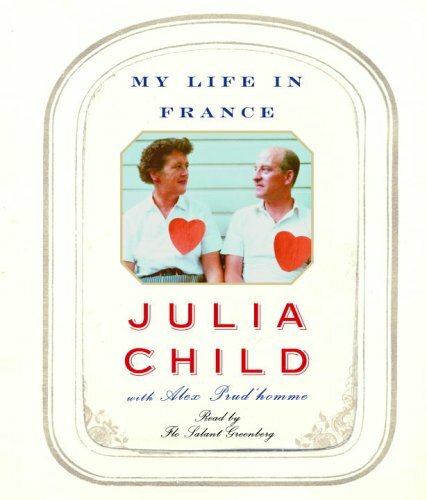 So at the last minute on Thursday, I’ll post about Julia Child and her memoir about her life in France. Listening to a book is always a much different experience than reading a book, and I think this would have been good to read. There are recipes recited and French words and phrases spouted without definition and I think I would have taken more in with my eyes than my ears. But I liked the general feeling that I got from the book. I liked hearing about the love that Julia and her husband had for each other, the support that Julia got for finding her passion in cooking, and the fascinating process they went through to get “Mastering the Art of French Cooking” published. Now I want that cook book, although Julia realized at the time of its publishing in the 1960s that it was already pushing the limits of what the American housewife would tackle, in the time and care that the French pour into their food preparation (and eating!). But yet the book and its successor were popular, as was the television show that she began filming. I will have to look up episodes of her TV show and think about tackling some simple French meals! Not a how-to manual, but a cute little read about a girl, almost 30, whose life appears to be crumbling around her – her fiance’ cancels the wedding and kicks her out of their home and she loses her job in PR with a Boy Band record label. So when her friend from college offers her a temporary job helping her out in Paris, she jumps on a plane and attempts to forget the worries she is leaving behind. A cute, easy read. I supplemented the experience by watching Craig Ferguson for the first time, because his show was shot in Paris for the week! I hear good things about the Ferguson but as a Fallon lover it’s hard to convert. So I relied on the DVR for the week and listened to Craig Ferguson. It really did add to the reading experience, and make me want to go to Paris!